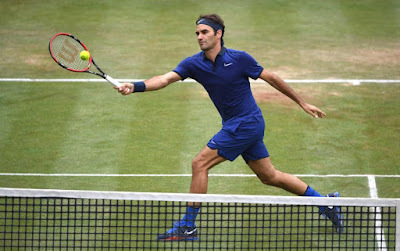 Roger Federer uncharacteristically failed to nail two match points as Dominic Thiem stunned the top seed on the grass in the rain-disrupted Stuttgart semi-finals on Saturday. The Swiss legend, who is returning from a back injury that ruled him out of the French Open, saw his preparations for Wimbledon unravel as Thiem battled through 3-6, 7-6 (7), 6-4. The third seed Thiem, a Roland Garros semi-finalist who moved into the ATP top 10 only this week, will Sunday play for his fourth title of the season against Philipp Kohlschreiber, who beat Juan Martin del Potro 6-3, 6-4 after a rain interruption of more than three hours. "You're always a little disappointed when you lose with match points," Federer said after surrendering the match points that would have given him a straight-sets victory. "But losing any match is not that great." 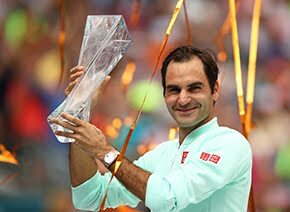 The contest was halted twice for a total of an hour by rain showers, but Federer - who turns 35 in August - did not attempt to make any excuses. "It was a good match from both sides in tough conditions," he said. The 17-time Grand Slam champion, who eased through the first set, put on a charge after falling behind 5-1 in the second set, winning five straight games. In the tiebreaker, Federer wasted one match point with a smash into the net. On the second, he tried to serve and volley behind a second serve but was passed by an impeccable return. Thiem won the set with a smash. The third set was interrupted after the fifth game with Thiem up a break after Federer missed a volley at the net. "We both had our chances throughout," Federer said. "Coming back in the second set was good but it was tough to lose in the breaker. "I can play better, but he came up with some good shots when he needed them." Thiem called the victory one of his best. ''I was incredibly nervous. I was fortunate in the tiebreaker but you need good luck to beat the best player on grass. I can't believe that I beat him on grass,'' said Thiem, who has little experience on grass. Federer is a seven-time Wimbledon champion. 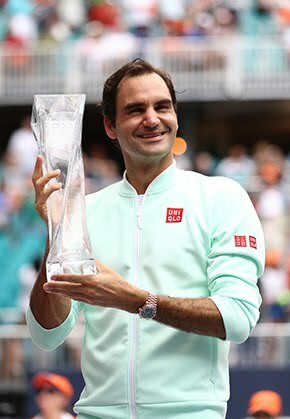 Federer's 2016 season has been interrupted by knee surgery and back pain which forced him to miss tournaments at Rotterdam, Dubai, Indian Wells Masters, Miami Masters, and much of the clay season including the French Open. His last title came in the autumn at home in Basel.